So it’s been a while but I finally got around to baking something last week. A friend had me over for a dinner of eggplant parmesan and I offered to bring dessert. Eggplant parmesan sounded like kind of a heavy meal (it didn’t turn out to be so, but no way to know that at the time), so I figured a light-ish dessert was in order. (Anything involving massive amounts of cream probably isn’t light really, but let’s just overlook that.) At first I considered being thematically consistent and making panna cotta. Then I ran through other ideas (cream cake, trifle), and then I figured ‘Why make things so complicated? 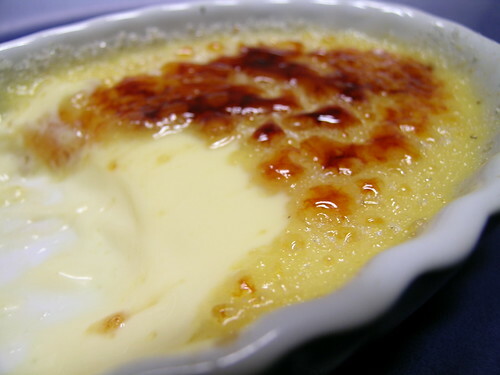 I have a creme brulee kit, I’ll make creme brulee.’ The kit included a recipe and it looked simple enough. So the plan was set. The only thing that went a bit wrong was the baking, which seemed to take two or three (or four, I stopped counting after a while) times longer than the recipe indicated. The custard ended up being a bit softer than it should’ve, I think, so it was a bit like eating melty vanilla ice cream (not that there’s anything wrong with that). Next time, I’ll probably go for a hotter oven (I’d turned the temp up to 350 by the end), and make the water bath deeper (the ramekins are so shallow that I was a bit timid about adding water to the roasting pan, for fear of accidentally flooding the works). I was going to serve it with raspberries atop, but forgot them in the fridge at home. Regardless, about the only thing I would’ve changed is, if I’d had vanilla bean pods, this seems like the sort of dessert that merits the addition of vanilla bean pod seeds. Preheat oven to 300. Put some water on to boil. 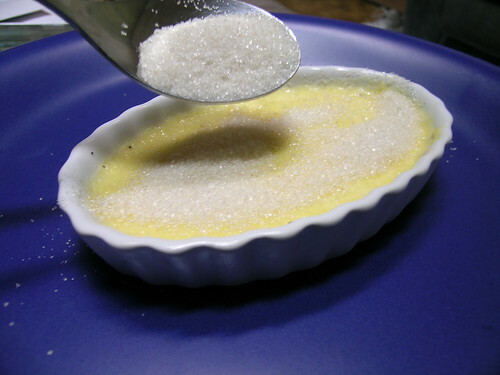 In a saucepan over medium heat, combine cream and 2 tablespoons of sugar. Cook, stirring occasionally, until small bubbles appear around edges of pan (5-6 minutes). Set aside. In a bowl, beat egg yolks and vanilla until smooth and light. Pour hot cream mixture into egg yolks a little at a time, beating continuously until well blended. Strain mixture through a fine sieve, then divide among four 4-oz ramekins. Arrange ramekins in a baking pan and place on middle shelf of oven. Add boiling water to pan until it rises halfway up the sides of the ramekins. Cover pan loosely with aluminum foil, and bake until custard is just set (about 25 minutes). 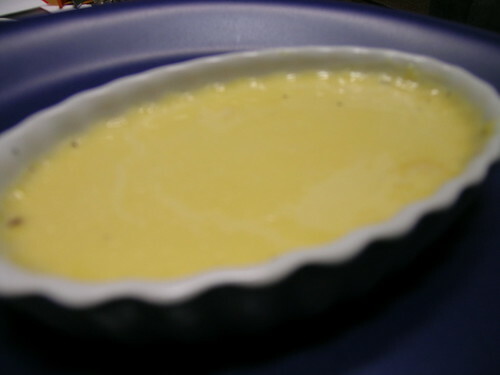 Then chill the custard for 2-3 hours. Sprinkle remaining 1/3 cup sugar over cooled custards, then torch ’em. 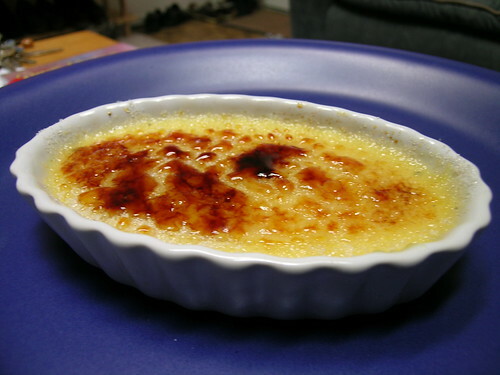 (The caramelization can be done under the broiler if one doesn’t have a blow torch. But there’s nothing like a little butane torch to help you command some respect. Especially if you’re in a room with a guy who’s spent some part of the evening playing target practice with a Nerf gun). Serve immediately, or refrigerate for later. 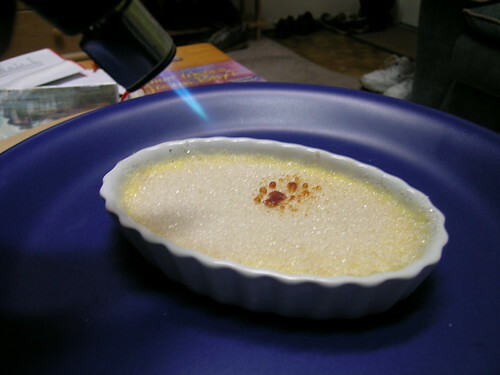 This entry was posted in baking, custard, dessert and tagged Crème brûlée, Custard. Bookmark the permalink.